In a large bowl, combine cake mix, egg, water, and 3 tablespoons butter. Beat until well combined. In a small bowl, mix together remaining melted butter, graham cracker crumbs and sugar. Spoon 1 tablespoon of graham cracker mixture into the bottom of 12 cupcake tins lined with parchment cupcake wrappers. Spoon 2 tablespoons of cake batter on top of the graham cracker crust. Bake cupcakes in a preheated oven for 8-12 minutes, just until the top springs back to the touch. Remove and cool completely. Soften ice cream and place large scoops on top of each cupcake. Please in freezer until solidly frozen. Turn on a large burner of a gas or electric stove. Place marshmallows on a skewer and toast over burner just until golden brown. (Or toast marshmallows over a hot grill if preferred.) Set marshmallows aside. Place chocolate chips in a small microwave-safe bowl. Heat until melted in microwave, about 60 seconds. Stir in chocolate frosting, then heat again until melty. Stir until smooth. Allow to cool to the touch. Working quickly, remove cupcakes from their wrappers. Top with chocolate frosting mixture and a toasted marshmallow. Work on 3 cupcakes at a time to keep the batch from becoming overly melty. Once marshmallows are in place, return cupcakes to the freezer until serving time. Can omit toasted marshmallows if desired. 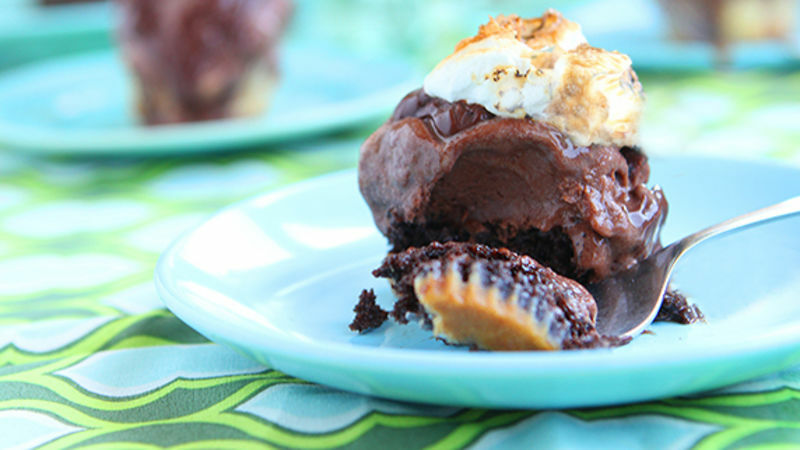 Best s'mores makeover yet: ice cream cupcakes! With all the s'mores fixin's ... even a toasted marshmallow on top. The graham cracker crust, rich chocolate cupcake, creamy chocolate ice cream and frosting, and toasty marshmallow perched on top make one pretty amazing s'mores dessert. You’ll beg for seconds. And...you don't even need a campfire. Ahhhmazing. This S'mores Ice Cream Cupcakes recipe more than satisfies any sweet tooth or s'mores craving you've got! Here’s what you’ll need for the most awesome s'mores dessert ever. You’ll spoon the graham cracker mixture into the cupcake tins, spoon the cake batter on top, and bake. It will smell so good in your house, you’ll nearly go crazy. But don't -- there’s only a few more steps. Once the cupcakes are cooled, scoop on the ice cream (yeah, you can have a few licks). Pop those babies in the freezer and take them out once they’re solid. Melt the chocolate chips for sixty seconds in the microwave. Stir in the chocolate frosting, and heat again until melty. Stir 'til it's smooth. Oh, ok ... just an itty bitty taste is allowed. Remove the frozen cupcakes from the wrappers and slather them with chocolatey frosting. Mmm. Place a toasted marshmallow on top of each cupcake. Hold your horses, we’re not quite done yet. Return the cupcakes to the freezer- this may be the hardest wait of your life! Are you thinking what I’m thinking? Let’s eat! Hey, did you know Betty Crocker has new Hershey's S'mores frosting and cupcake mix? Look for it at the store!